The stubble burning, especially in Punjab and Haryana, a major cause of pollution in Delhi, is estimated to be around 35 million tonnes, was banned by the tribunal in November 2015. NEW DELHI: The National Green Tribunal on Friday rapped the Punjab government for not doing anything to control the stubble burning that leads to smog in Delhi and the NCR. The tribunal had also rapped the Punjab government in November, asking the state authorities to present even one farmer who was assisted by the state government and still burnt the agricultural residue. 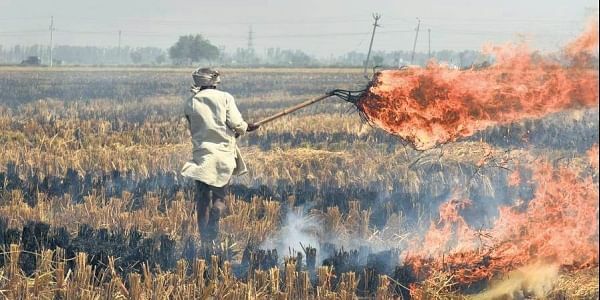 The bench headed by NGT Chairperson Justice Swatanter Kumar on Friday directed the authorities to present the details of steps taken to date to lift the agricultural residue from the farmland so that farmers did not burn it. "What have you done to encourage the setting up of biomass plants and pallet plants in the state? Have you invited any thermal power plant to use agriculture residue? Did you take any step to provide incentives to the industry so that it collects it from the field," the bench asked. The tribunal also asked if the Punjab government approached and partnered with public or private company that make goods from crop residue. "Did you check in other states... Have you ever contacted any such company in Maharashtra," the bench said. Expressing its dissatisfaction over the conduct of state government in handling the issue, the bench said: "We are shocked the way you people are behaving. None of you take any step in this regard." The stubble burning, especially in Punjab and Haryana, estimated to be around 35 million tonnes, was banned by the tribunal in November 2015. It is a major cause of pollution in Delhi. The matter has been listed for Monday, December 11.